At Sudan’s eastern border, Lt. Samih Omar led two patrol cars slowly over the rutted desert, past a cow’s carcass, before halting on the unmarked 2,000-mile route that thousands of East Africans follow each year in trying to reach the Mediterranean, and then onward to Europe. But the relationship is unmistakably deepening. A recent dialogue, named the Khartoum Process (in honor of Sudan’s capital) has become a platform for at least 20 international migration conferences between European Union officials and their counterparts from several African countries, including Sudan. The European Union has also agreed that Khartoum will act as a nerve center for countersmuggling collaboration. While no European money has been given directly to any Sudanese government body, the bloc has funneled 106 million euros — or about $131 million — into the country through independent charities and aid agencies, mainly for food, health and sanitation programs for migrants, and for training programs for local officials. “While we engage on some areas for the sake of the Sudanese people, we still have a sanction regime in place,” said Catherine Ray, a spokeswoman for the European Union, referring to an embargo on arms and related material. “We are not encouraging Sudan to curb migration, but to manage migration in a safe and dignified way,” Ms. Ray added. Ahmed Salim, the director of one of the nongovernmental groups that receives European funding, said the bloc was motivated by both self-interest and a desire to improve the situation in Sudan. “They don’t want migrants to cross the Mediterranean to Europe,” said Mr. Salim, who heads the European and African Center for Research, Training and Development. But, he said, the money his organization receives means better services for asylum seekers in Sudan. “You have to admit that the European countries want to do something to protect migrants here,” he said. Critics argue the evolving relationship means that European leaders are implicitly reliant on — and complicit in the reputational rehabilitation of — a Sudanese security apparatus whose leaders have been accused by the United Nations of committing war crimes in Darfur. On the border near Abu Jamal, Lieutenant Omar and several members of his patrol are from the wing of the Sudanese security forces headed by Salah Abdallah Gosh, one of several Sudanese officials accused of orchestrating attacks on civilians in Darfur. Elsewhere, the border is protected by the Rapid Support Forces, a division of the Sudanese military that was formed from the janjaweed militias who led attacks on civilians in the Darfur conflict. The focus of the group, known as R.S.F., is not counter-smuggling — but roughly a quarter of the people-smugglers caught in January and February this year on the Eritrean border were apprehended by the R.S.F., Lieutenant Omar said. The planned countertrafficking coordination center in Khartoum — staffed jointly by police officers from Sudan and several European countries, including Britain, France and Italy — will partly rely on information sourced by N.I.S.S., according to the head of the immigration police department, Gen. Awad Elneil Dhia. The regular police also get occasional support from the R.S.F. on countertrafficking operations in border areas, General Dhia said. Yet the Sudanese police are operating in one unexpected place: Europe. In a bid to deter future migrants, at least three European countries — Belgium, France and Italy — have allowed in Sudanese police officers to hasten the deportation of Sudanese asylum seekers, General Dhia said. Nominally, their official role is simply to identify their citizens. But the officers have been allowed to interrogate some deportation candidates without being monitored by European officials with the language skills to understand what was being said. More than 50 Sudanese seeking asylum in Europe have been deported in the past 18 months from Belgium, France and Italy; The New York Times interviewed seven of them on a recent visit to Sudan. Four said they had been tortured on their return to Sudan — allegations denied by General Dhia. One man was a Darfuri political dissident deported in late 2017 from France to Khartoum, where he said he was detained on arrival by N.I.S.S. agents. Over the next 10 days, he said he was given electric shocks, punched and beaten with metal pipes. At one point the dissident, who asked that his name be withheld for his safety, lost consciousness and had to be taken to the hospital. He was later released on a form of parole. European officials argue that establishing Khartoum as a base for collaboration on fighting human smuggling can only improve the Sudanese security forces. The Regional Operational Center in Khartoum, set to open this year, will enable delegates from several European and African countries to share intelligence and coordinate operations against smugglers across North Africa. Even General Dhia now admits that Sudan extradited the wrong man — albeit one who, he says, admitted while in Sudanese custody to involvement in smuggling. “There were two people, actually — two people with the same name,” General Dhia said. Mr. Berhe nevertheless remains on trial in Italy, accused of being Mr. Mered — and of being a smuggler. Beyond that, the Sudanese security services have long been accused of profiting from the smuggling trade. Following European pressure, the Sudanese Parliament adopted a raft of anti-smuggling legislation in 2014, and the rules have since led to the prosecution of some officials over alleged involvement in the smuggling business. But according to four smugglers whom I interviewed clandestinely during my trip to Sudan, the security services remain closely involved in the trade, with both N.I.S.S and R.S.F. officials receiving part of the smuggling profits on most trips to southern Libya. The head of the R.S.F., Brig. Mohammed Hamdan Daglo, has claimed in the past that his forces play a major role in impeding the route to Libya. But each smuggler — interviewed separately — said that the R.S.F. was often the main organizer of the trips, often supplying camouflaged vehicles to ferry migrants through the desert. 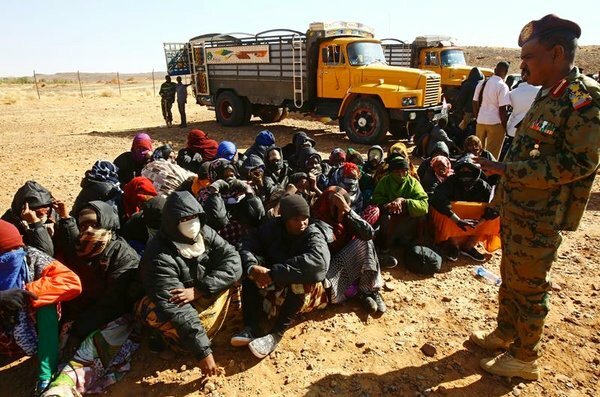 After being handed over to Libyan militias in Kufra and Sabha, in southern Libya, many migrants are then systematically tortured and held for ransom — money that is later shared with the R.S.F., each smuggler said. Rights activists have previously accused Sudanese officials of complicity in trafficking. In a 2014 report, Human Rights Watch said that senior Sudanese police officials had colluded in the smuggling of Eritreans. General Dhia said that the problem did not extend beyond a few bad apples. Sudan, he said, remains an effective partner for Europe in the battle against irregular migration. The first part of our new investigation finds key individuals in the Khartoum regime complicit in #smuggling and trafficking. Reporting from Egypt, Sudan, Eritrea and the Netherlands reveals security services involved in a trade they are meant to police. En l’absence d’une prise en compte des causes profondes des migrations, seuls les officiels corrompus et les trafiquants tirent bénéfice de la criminalisation des migrants. Alors que des millions de dollars de fonds de l’Union européenne affluent au Soudan pour endiguer la migration africaine, les demandeurs d’asile témoignent : ils sont pris au piège, et vivent dans un état perpétuel de peur et d’exploitation dans ce pays de transit. Migreurop demande l’arrêt immédiat de toutes les collaborations initiées par l’Union européenne et ses Etats membres avec la dictature d’Omar El-Béchir et avec tout Etat qui bafoue les droits fondamentaux. Il y a longtemps que l’UE a fait le choix de sous-traiter à des pays tiers, sous couvert d’un partenariat inéquitable et avec des fonds issus du développement, la lutte contre l’immigration irrégulière et même la gestion de la demande d’asile. Ce processus d’externalisation, qui s’accompagne de la délocalisation de la surveillance des frontières européennes très en amont de leur matérialisation physique, a été encore renforcé à la suite de la si mal nommée « crise des réfugiés » . Ainsi, dans le cadre du Processus de Khartoum, initié par l’UE en 2014 et consolidé suite au Sommet de La Valette de fin 2015, les régimes les plus répressifs, tels que le Soudan et l’Erythrée – que des dizaines de milliers de demandeurs d’asile cherchent à fuir – bénéficient de subsides pour retenir leur population et « sécuriser » leurs frontières… sans que l’UE ne se préoccupe des atteintes dramatiques portées aux droits humains dans ces pays. Dans ce domaine, l’UE et les États membres agissent de concert. Ainsi, de nombreux pays européens n’hésitent pas à renvoyer vers Khartoum des ressortissants soudanais - peu importe qu’il puisse s’agir de demandeurs d’asile - et à collaborer avec les autorités locales pour faciliter ces expulsions. Dernièrement, c’est dans un parc bruxellois que des émissaires soudanais procédaient à l’identification de leurs nationaux en vue de leur retour forcé, semant la terreur parmi les personnes exilées qui y campaient . Si l’affaire a suscité de vives réactions, le gouvernement belge s’est retranché, pour se justifier, derrière l’exemple donné par ses voisins et continue de programmer des expulsions de ressortissants soudanais . En France, une coopération similaire existe ainsi depuis 2014 : des représentants de Khartoum auraient visité plusieurs centres de rétention pour identifier des ressortissants soudanais et faciliter leur renvoi . Selon les chiffres dont disposent les associations qui interviennent dans les CRA français, 9 personnes auraient été renvoyées vers le Soudan depuis 2015 et environ 150 remises à l’Italie et exposées au risque d’un renvoi vers Khartoum depuis le territoire italien. Par ailleurs, des retours forcés vers le Soudan ont eu lieu depuis l’Allemagne, l’Italie et la Suède, grâce notamment à des accords de police bilatéraux, souvent publiés uniquement à la suite des pressions exercées par la société civile  . L’Italie, à l’avant-garde de la vision sécuritaire en matière de collaboration dans le domaine des migrations, a ainsi conclu en août 2016 un accord de coopération policière avec le Soudan, dans le cadre duquel 48 personnes, originaires du Darfour, ont été refoulées à Khartoum. Celles qui ont pu résister à leur renvoi depuis l’Italie ont demandé et obtenu une protection, tandis que cinq des personnes refoulées ont porté plainte auprès de la Cour européenne des droits de l’Homme . Ces accords et pratiques bafouent en effet toutes les obligations des pays européens en matière de respect des droits humains (droit d’asile, principe de non-refoulement, interdiction des expulsions collectives et des traitements inhumains et dégradants, droit à la vie, etc…) et révèlent le cynisme qui anime l’Union et les États-membres, prêts à tout pour refuser aux exilés l’accès au territoire européen. Il faut le dire et le répéter : toute forme de coopération avec les autorités soudanaises bafoue les obligations résultant du droit international et met en danger les personnes livrées par les autorités européennes au dictateur Omar el-Béchir. Le réseau Migreurop et ses membres demandent en conséquence l’arrêt immédiat des expulsions vers le Soudan et de toute démarche de coopération avec ce pays.